This is the second in our Contours of Crisis paper series. The first article set the stage for the series. It began by outlining the conventional view that this is a finance-led crisis, that this turmoil was triggered and amplified by “financial excesses”; it then described the domino sequence of collapsing markets—a process that started with the meltdown of the U.S. housing and FIRE sectors (finance, insurance and real estate), expanded to the entire financial market, and eventually pulled down the so-called “real economy”; and, finally, it situated the pattern and magnitude of the current decline in historical context. Taken in its totality, the “real” economy is the site where production and consumption take place, where sweat and tears are shed so that desires can be fulfilled, where factors of production mix with technology, where capitalists invest for profit and workers labor for wages, where conflict clashes with cooperation, where anonymous market forces meet the visible hand of power. It’s the raison d’être, the locus of action, the means and ends of economics. It is the real thing. Unfortunately, this logic makes us go in a circle. Recall that the starting point of the mismatch thesis is an ideal equality between the money quantity of capitalization and the “real” quantity of capital. But now it turns out that the “real” quantity of capital—the entity that nominal finance supposedly equals to and unfortunately distorts—is itself nothing but … money! So, in the end, there is no “real” benchmark—and yet, without such benchmark, what exactly is there to mismatch? But not all is lost. Convention has it that there is nonetheless order in the chaos, a certain rationality in the irrationality. The basic reason is that greed tends to operate mostly on the upswing, whereas fear usually sets in on the downswing. “We tend to label such behavioral responses as non rational,” explains the ever-quotable Alan Greenspan, “But forecasters’ concerns should be not whether human response is rational or irrational, only that it is observable and systematic.”[Note 25] Regularity puts limits on irrationality; limits imply predictability; and predictability helps keep the faith intact and the laity in place. The boundaries of irrationality are well known and can be recited even by novice traders. The description usually goes as follows. In the upswing, the growth of investment in productive assets fires up the greedy imagination of investors, causing them to price financial assets even higher. To illustrate, during the 1990s developments in “high-tech” hardware and software supposedly made investors lose sight of the possible. The evidence: they capitalized information and telecommunication companies, such as Amazon, Ericsson and Nortel, far above the underlying increase in their so-called “real” value. A similar scenario unfolded in the 2000s. Investors pushed real-estate capitalization, along with its various financial derivatives and structured investment vehicles, to levels that far exceeded the underlying “actual” wealth. This bounded irrationality is illustrated by the thin line in Figure 4. Note that this series is a hypothetical construct. It describes what the growth of capitalization might look like when neoclassical orthodoxy gets “distorted” by irrationality and market aberrations. The value for each year in the hypothetical series is computed in two steps. First, we calculate the deviation of the growth rate of the (smoothed) “real” series from its historical mean (so if the smoothed growth rate during the year is 8% and the historical mean rate is 6.7%, the deviation is 1.3%). Second, we add 2.5 times the value of the deviation to the historical mean (so in our example, the hypothetical smoothed growth rate would be 2.5 × 1.3 + 6.7 = 9.95%). The coefficient of 2.5 is purely arbitrary. A larger or smaller coefficient would generate a larger or smaller amplification, but the cyclical pattern would remain the same. This simulation solves the riddle of the fluctuating Tobin’s Q. It shows how, due to market imperfections and investors’ irrationality, the growth of capitalization overshoots “real” accumulation on the upswing, therefore causing Tobin’s Q to rise, and undershoots it on the downswing, causing Tobin’s Q to decline. And so everything falls into place. Tobin’s Q averages more than 1 due to an invisible, yet very real intangible revolution. And it fluctuates heavily—admittedly because the market is imperfect and humans are not always rational—but these oscillations are safely bounded and pretty predicable. The dollar value of capitalization indeed deviates from the “real” assets, but both the image and the “fundamentals” it reflects move in the same direction. It turns out that while the priests of economics were busy fortifying the faith, the gods were having fun with the facts. The result is illustrated in Figure 5 (where both series again are smoothed as 10-year moving averages). The thick line, as in Figure 4, shows the rate of change of corporate fixed assets measured in current replacement cost. But the thin line is different. 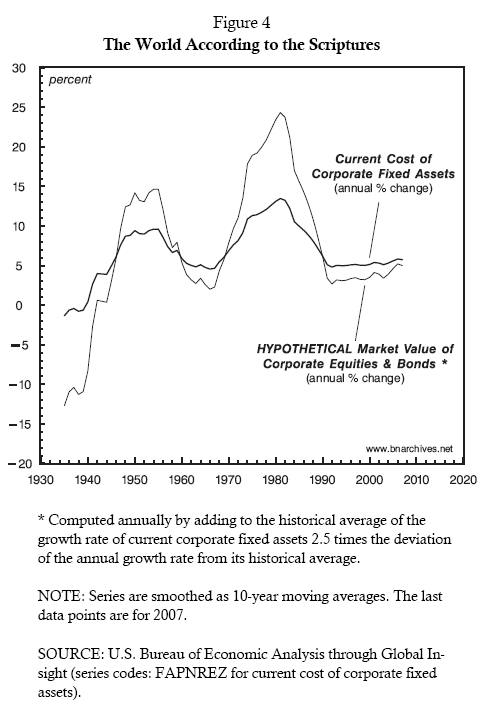 Whereas in Figure 4 this line shows the rate of growth of capitalization stipulated by the theory, here it shows the actual rate of growth as it unfolded on the stock and bond markets. And the difference couldn’t have been starker: the gyrations of capitalization, instead of amplifying those of “real” assets, move in exactly the opposite direction. This reality puts the world on its head. One could perhaps concede that “real” assets do not have a material quantum—yet pretend, as we have agreed to do here, that somehow this nonexistent quantum is proportionate to its dollar price. One could further accept that the dollar value of “real” assets is misleading insofar as it excludes the “dark matter” of intangible assets (up to 80% of the total)—yet nonetheless be convinced that these invisible intangibles are miraculously “revealed” by the know-all market. Finally, one could allow economic agents to be irrational—yet assume that their irrational pricing of assets ends up oscillating around the rational “fundamentals” (whatever they may be). 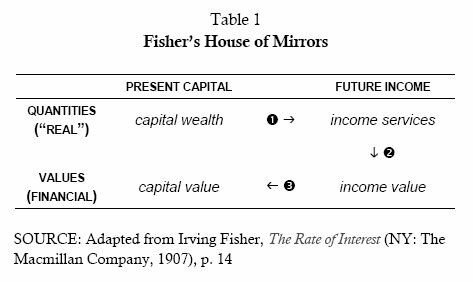 But it seems a bit too much to follow Fisher and claim that the long-term growth rate of capitalization is driven by the accumulation of “real” assets when the two processes in fact move in opposite directions. And, yet, that is precisely what neoclassicists (and most Marxists) seem to argue. Both emphasize the growth of “real” assets as the fountain of riches—while the facts say the very opposite. 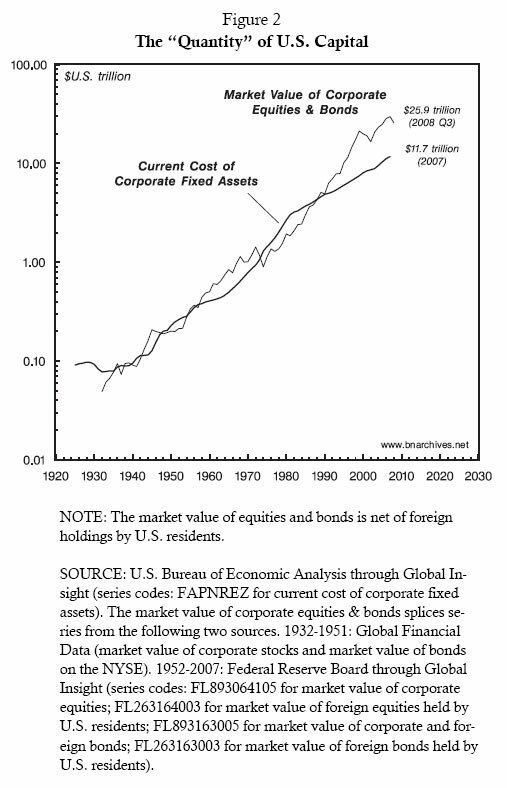 According to Figure 5, during the 1940s and 1970s, when the dollar value of “real” assets expanded the fastest, capitalists saw their capitalization growth dwindling. 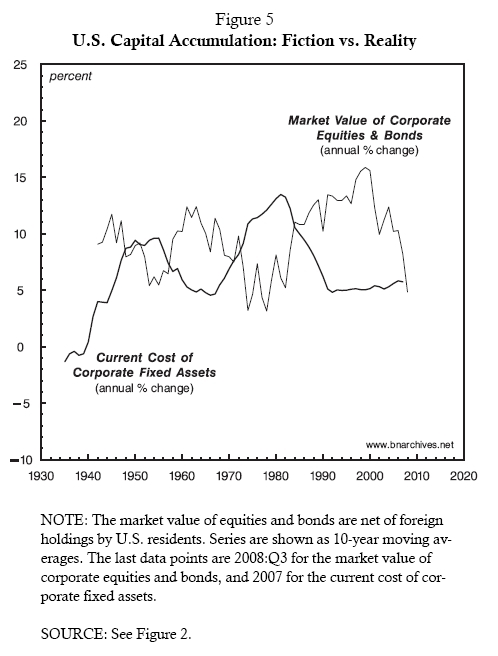 And when the value of “real” assets decelerated—as they had during the 1950s and early 1960s, and, again, during the 1980s and 1990s—the capitalists were laughing all the way to the stock and bond markets. Given these considerations, it is hardly surprising that few economists predicted the current crisis—and that, of those who did, none rested their case on evidence of a finance/“reality” mismatch. There was simply no evidence to use. There was no way of knowing the “real” quantity of capital before the crisis started, and therefore no way of knowing whether or not this quantity was distorted by finance. And there was also no point in hanging one’s hopes on the nominal value of capital goods—since this value, whatever its stands for, is always distorted by finance. With this dismal record, why do capitalists continue to employ economists and subsidize their university departments? Shouldn’t they fire them all, demand that their Nobel Laureates be stripped of their prizes and close the tap of academic money? The answer is not in the least, and for the most obvious of reasons: misleading explanations help divert attention from what really matters. The economists would have the laity believe that the “real thing” is the tangible quantities of production, consumption, knowledge and the capital stock, and that the nominal world merely reflects this “reality” with unfortunate distortions. This view may appeal to workers, but it has nothing to do with the reality of accumulation. For the capitalists, the only real thing is nominal capitalization, and what lies behind this capitalization is not the production cost or productivity of capital goods, but the fist of capitalist power. To study this power is to study the logic of the capitalist order, and it is here that the economists come in handy. By emphasizing production and consumption, they help avert, divert and marginalize any attempt to understand the power underpinnings of accumulation. But the times, they are a-changin’. The current crisis has caused the economists’ stature to diminish somewhat, and with the smokescreen dissipating, if only briefly, the power basis of capital comes into view. For more on that issue, stay tuned for the next installment in our series. 1. Edmund L. Andrews, Greenspan Concedes Error on Regulation, New York Times, October 23, 2008, p. 1. 2. Gillian Tett, Lost Through Destructive Creation, FT Series: Future of Capitalism, Financial Times, March 10, 2009, p. 9. 3. 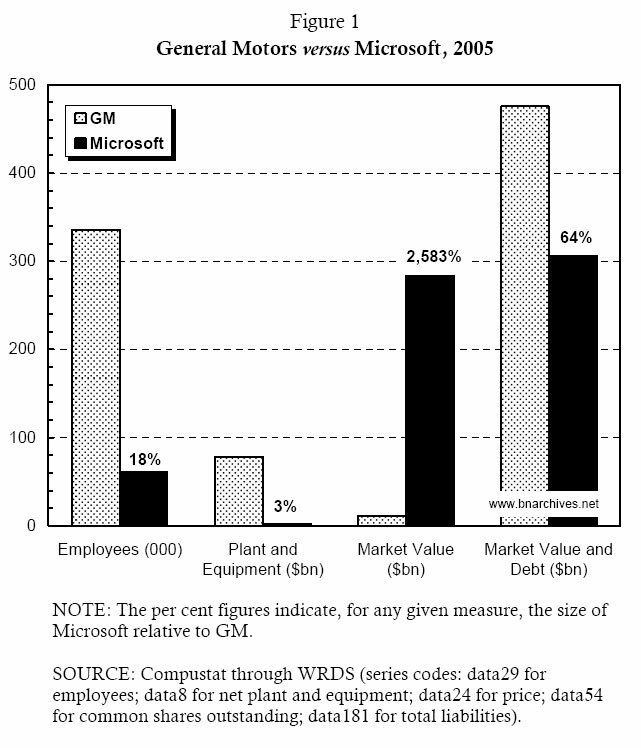 “All the sophisticated mathematics and computer wizardry,” observes the high priest, “essentially rested on one central premise: that the enlightened self-interest of owners and managers of financial institutions would lead them to maintain a sufficient buffer against insolvency by actively monitoring their firm’s capital and risk position” (Alan Greenspan, We Need a Better Cushion Against Risk, Financial Times, March 23, 2009, pp. 9). “[T]hose of us who have looked to the self-interest of lending institutions to protect shareholder’s equity (myself especially) are in a state of shocked disbelief. Such counterparty surveillance is a central pillar of our financial markets’ state of balance. If it fails, as occurred this year, market stability is undermined” (U.S. Congress, Testimony of Dr. Alan Greenspan, the Committee of Government Oversight and Reform, October 23, 2008). 4. John Kay, Kudos for the Contrarian, Financial Times, December 30, 2008, p. 9. 5. Gideon Rachman, Generation L and its Fearful Future, Financial Times, January 13, 2009, p. 11. 6. Some of our arguments here draw on Chapter 10 of our book Capital as Power. A Study of Order and Creorder (London and New York: Routledge, 2009), as well as on our earlier monograph, The Gods Failed, The Priests Lied (Montreal and Jerusalem, Hebrew, May 2007). 7. Martin Sorrell, The Pendulum Will Swing Back, Financial Times, April 9, 2009, p. 9. 8. Editors, The Return of the ‘Real’ Economy, Financial Times, December 31, 2008, p. 6. 9. John Kay, Why More Regulation Will Not Save Us from the Next Crisis, Financial Times, March 26, 2008, p. 15; Vincent Boland, Top Economists Press for Banking Regulation Shake-Up, Financial Times, December 4, 2008 and Economists Join Drive for Rethink on Regulation, Financial Times, December 16, 2008, p. 25. 10. Irving Fisher, The Rate of Interest (NY: The Macmillan Company, 1907), pp. 13-14, original emphases. 11. John Stuart Mill, Principles of Political Economy. With Some of Their Applications to Social Philosophy (New York: Co-operative Publication Society Mill: 1848. ), Book 3, Ch. 7. 12. Lucas Papademos and Franco Modigliani, The Supply of Money and the Control of Nominal Income, in Handbook of Monetary Economics, edited by B. Friedman and F. Hahn (New York: North Holland, 1990), p. 405. 13. Marx’s view on the difference between financial and “real” capital and their tendency to converge through crisis is carefully examined in Michael Perelman, The Phenomenology of Constant Capital and Fictitious Capital, Review of Radical Political Economics, 1990, Vol. 22, Nos. 2-3, pp. 66-91. 14. The quotes are from Stanley W. Jevons, The Theory of Political Economy, (Harmondsworth, Middlesex, England: Penguin, 1871), p. 11 and Alfred Marshall, Principles of Economics. An Introductory Volume, 8th ed. (London: Macmillan, 1920), p. 78. 15. The first quote is from Karl Marx, Capital. A Critique of Political Economy. Vol. 1: The Process of Capitalist Production. (Chicago: Charles H. Kerr & Company, 1867 ), p. 51. The second quote is from Karl Marx, A Contribution to the Critique of Political Economy (Chicago: Charles Kerr & Company, 1911), p. 299. 16. The logical impossibility of this conversion is examined in Philip Harvey, The Value-Creating Capacity of Skilled Labor in Marxian Economics, Review of Radical Political Economics, 1985, Vol. 17, No. 1-2, pp. 83-102. For a broad critique of Marx’s value theory, see Nitzan and Bichler, Capital as Power. A Study of Order and Creorder (London and New York: Routledge, 2009), Chs. 6-7. 17. The actual computation, of course, is a bit more involved. In practice, the economists consider the quantity of “real” capital as equal not to its actual dollar value, but to its “constant” dollar value—i.e., to its aggregate nominal dollar value divided by its unit price. The problem is that in order to compute the price of a unit of “real” capital, we first need to know what that unit is. However, as we have seen, this unit—expressed in either utils or abstract labor—is unknowable, so the economists are forced to pretend. They convince themselves that they know what this unit is, assign it a price and then use this price to “deflate” the dollar value of capital goods. 18. Alan Greenspan, Equities Show Us the Way to Recovery, Financial Times, March 30, 2009, p. 9. 19. A logarithmic scale amplifies the variations of a series when its values are small and compresses these variations when the values are large. This property makes it easier to visualize exponential growth (note that the numbers on the scale jump by multiples of 10). 20. The Q-ratio was proposed by James Tobin and William Brainard as part of their analysis of government stabilization and growth policies. See their articles Pitfalls in Financial Model Building, American Economic Review. Papers and Proceedings, 1968, Vol. 58, No. 2, May, pp. 99-122; and Asset Markets and the Cost of Capital, in Economic Progress, Private Values, and Public Policy: Essays in the Honor of William Fellner, edited by B. Balassa and R. Nelson (Amsterdam and New York: North-Holland Publishing Co. 1977), pp. 235-262. 21. For mainstream analyses of intangibles, see for example, Baruch Lev, Intangibles. Management, Measurement, and Reporting (Washington, D.C.: Brookings Institution Press, 2001); and Carol Corrado, Charles Hulten and Daniel Sichel, Intangible Capital and Economic Growth, Finance and Economics Discussion Series, Federal Reserve Board, Division of Research & Statistics and Monetary Affairs, Washington DC, 2006. 22. The “Quantity Revelation Theorem” is articulated in Martin Neil Bailey, Productivity and the Services of Capital and Labor, Brookings Papers on Economic Activity, 1981, No. 1, pp. 1-50. A no-questions-asked application of this theorem is given in Robert E. Hall, The Stock Market and Capital Accumulation, The American Economic Review, 2001, Vol. 91, No. 5, December, pp. 1185-1202. 23. Keith Cardoza, Justin Basara, Liddy Cooper and Rick Conroy, The Power of Intangible Assets: An Analysis of the S&P 500, Chicago, Illinois: Ocean Tomo, Intellectual Capital Equity, 2006. 24. If, as is now fashionable to believe, the trend growth rate of intangibles is faster than that of tangibles, then the overall growth rate of so-called “real” assets (tangible and intangible) would gradually rise above the growth rate of tangible assets only illustrated in Figure 4. However, since the cyclical pattern would be more or less the same, this possibility has no bearing on our argument. 25. Alan Greenspan, We Will Never Have a Perfect Model of Risk, Financial Times, March 17, 2008, p. 9. 26. Eric Janszen, The Next Bubble. Priming the Markets for Tomorrow’s Big Crash, Harper’s Magazine, February 2008, pp. 39-45. 27. George Soros, The Crisis & What to Do About It, The New York Review of Books, 2008, Vol. 55, No. 19, December 4. 28. Given our rejection of “material” measures of capital, there is no theoretical value in comparing the growth of the two series when measured in so-called “real” terms. But just to defuse the skepticism, we deflated the two series by the implicit price deflator of gross investment and calculated their respective “real” rates of change. The result is similar to Figure 5: the two growth rates move in opposite directions.